Powered by the Kirin 970 chipset, the Honor View 10 features some high-end features at a very decent price. And that price looks even better with a $120 or 24% discount to $379.99 at both Amazon and B&H (via Android Police). The phone features a 6-inch LCD display with a 1080 x 2160 (FHD+) resolution. That works out to an 18:9 aspect ratio. 6GB of RAM is inside along with 128GB of native storage. On the back of the Honor 10 View, you'll find a dual camera setup (16MP + 20MP) and there is a 13MP snapper in front for selfies. Keeping the lights on is a nice-sized 3750mAh battery, and the phone has been updated to Android 9 Pie. So as you can, for $379.99 this is quite a delectable deal. 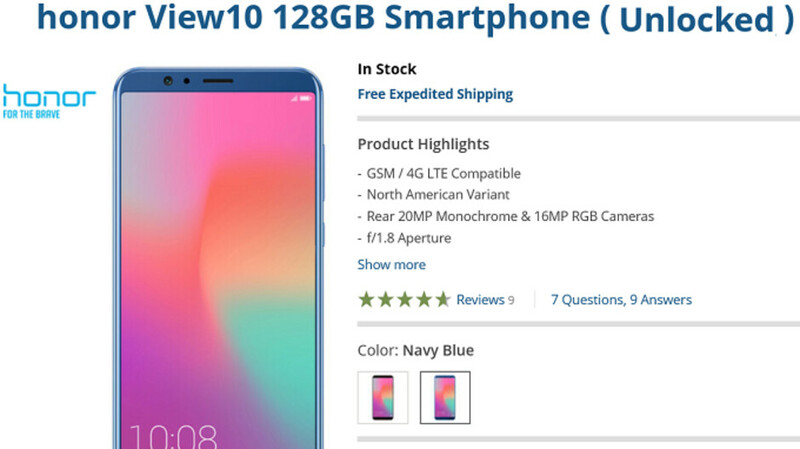 The handset is available at this price from B&H in Midnight Black and Blue, and on Amazon the only color offered at this price is Blue. This is the North American variant of the phone, and while it is unlocked, it is compatible with GSM carriers only. That means that this phone will work for AT&T and T-Mobile subscribers. Sorry Verizon and Sprint customers, you'll have to sit this one out.